A locked-room mystery is solved by detective Fleming Stone. Sanford Embury refused to give his wife an allowance of spending cash or even a checking account. He pays all the bills and her store charge accounts. "Eunice found it intolerable to be cramped and pinched for small amounts of ready cash, when her husband was a rich man." "Eunice Embury was neither mean nor spiteful of disposition. She had a furious temper, but she tried hard to control it, and when it did break loose, the spasm was but of short duration and she was sorry for it afterward. Her husband declared he had tamed her, and that since her marriage, about two years ago, his wise, calm influence had curbed her tendency to fly into a rage and had made her far more equable and placid of disposition." Sanford is found dead in bed, alone, with the door of his second-story bedroom bolted shut from the inside. Was his wife a party to the murder, or perhaps did she commit the murder in a fit of rage? Who else had a motive? How does Sanford make all that money? How could the murderer do the deed if the room was locked from the inside? 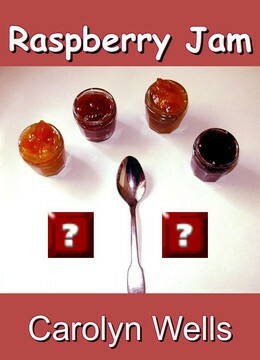 The clue that leads to the discovery of the murderer and the devious method used is — you guessed it — some raspberry jam.